One of the most important cases the US Supreme Court will consider this term is Hobby Lobby’s lawsuit challenging the Obamacare mandate that employer-provided health care plans must cover abortion and contraceptives. 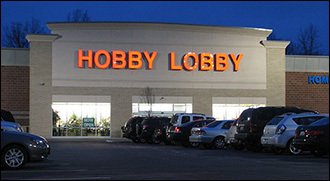 Hobby Lobby, a corporation owned and managed by a traditional Christian family, argues that the mandate violates their First Amendment rights. Much of the discussion has focused on whether a corporation such as Hobby Lobby can even have First Amendment rights. But the issue of “corporate personhood” is a smokescreen. Hobby Lobby’s corporate status has no bearing on whether under Obamacare, Hobby Lobby’s owners, about whose personhood there is no doubt, have a right to run their business in a manner consistent with their moral beliefs. If the form by which Hobby Lobby did business was relevant to its right to operate free of federal interference, then Hobby Lobby could avoid the Obamacare mandate by simply reorganizing itself as a partnership or sole proprietorship. Some Obamacare supporters cast this case as a conflict between Hobby Lobby’s First Amendment rights and the rights of its employees to contraception and abortion. Hobby Lobby is not trying to stop its employees from obtaining contraceptives and abortions; it is simply asking that the government not force it to pay for them. Forcing Hobby Lobby to pay for abortion services is especially offensive because Hobby Lobby’s owners consider abortion a form of murder. Those who, like me, agree that abortion is an act of violence against an innocent person, will side with Hobby Lobby. However, this case is not about the legality of abortion. It is about whether someone can have a “right” to force someone else to provide him with a good or service. Therefore, even those who support legal abortion should at least support a business’s right to choose to not subsidize it. Supporters of the mandate claim Congress has the power to create rights to privately-provided goods and services. They also say that Congress has the power to legislatively override the rights of religious liberty, property, and contract. It is fair to ask what is the source of Congress’s power to create new rights. It certainly does not originate in the Declaration of Independence, which expressly denies that rights come from the government; or from the United Stares Constitution, which nowhere granted government the power to redistribute or create artificial rights. The principle that Government can force businesses to violate their religious principals even if those principles conflict with civil law could be applied in ways some Obamacare supporters may find objectionable. For example, what if the government argued that the Pentagon’s need for some products produced by a Quaker-owned business trumped the Quaker owner’s objections to war? The hypothetical example above shows just how radical and dangerous are arguments in support of the Obamacare abortion and contraception mandate. If Hobby Lobby loses, the US Supreme Court will have endorsed the idea that the federal government can force individuals to violate their most sacred religious principles to satisfy any government demands. The central question of the Hobby Lobby case, then, is whether religious liberty will continue to be meaningful in this country. For what good is a religious liberty that protects your rights to attend a worship service, but allows the government to force you to live in opposition to the values preached at those services? This is why all supporters of liberty and limited government—regardless of their views on the morality of contraception—should be on the side of Hobby Lobby. Former Congressman Ron Paul’s article first appeared at the-free-foundation.com, the temporary home for his weekly column until his personal web page is up and running.